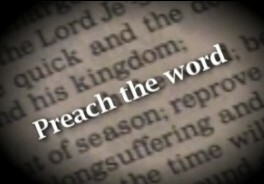 The task of preaching is an ancient practice. * Yet, as we might expect, the focus of preaching has changed throughout history. By the late twentieth century preaching generally focused on expository sermons where the truths of a particular text would be expounded upon. While there’s much to commend about expository preaching, the sermon often capitulated the culture of American individualism so that preaching served as a therapeutic exercise aimed at addressing individual felt needs. Consequently it’s now quite common to hear of Christians church shopping like they shop for cars, attempting to find the church that perfectly meets their needs. Such preaching “christianizes the horizons” which the hearers, Christian or not, bring with them allowing the “fundamental convictions” of those horizons to remain (Wright, Telling God’s Story, 37). The problem is that since Christian preaching is ordained of Christ, it must serve the aim of the gospel of Christ. This aim is not the baptism of American culture(s). Rather the aim of the gospel is the formation of a people reconciled to God and one another who will bear witness to God’s redemptive mission by living as a redeemed people among people yet to be redeemed. This is why the New Testament is concerned not only with what God has done in Christ but also with how this redemptive history bears upon the moral formation of those who belong to Christ. So Paul charges the evangelist Timothy with the task of preaching. Paul writes in 2 Timothy 4:2, “Preach the word; be prepared in season and out of season; correct, rebuke and encourage…” In the larger context we learn that Paul is so adamant about the necessity of such preaching because some will turn away from the truth (v. 5). It’s important to recognize that in Paul’s day, “truth” was as much a way of life as it was a belief or confession. In other words, to embrace truth required both belief and living. Conversely, any way of life that is inconsistent with the confessed belief was just as much a rejection of truth as it was for those who rejected proper belief. So Paul charges Timothy with preaching the word in order to form the church in the truth, so that the life and beliefs of the church become a coherent product of the gospel which results in the church becoming a portrait of the gospel. This I believe is the necessary task of preaching today. We live in a culture where the difference between Christians and the rest of society has become so blurred that some might wonder if there’s any difference. The church must again be formed in the truth, the aim of the gospel. This means the task of preaching is not to offer applicable take aways that address the various felt needs of individuals, allowing scripture to be absorbed into their lives as is. Rather, the task of preaching is to open the scriptures, calling the church to embrace the world that God’s word imagines with all of the necessary beliefs and virtuous practices necessary to encompass the truth. If this were not so then conversation Jesus had with the rich man in Luke 18 would have ended with Jesus reminding him of the commandments (v. 20). For with Jesus’ mention of the commandments, the rich man had an applicable take away necessary for the him to be at peace with his life as it was. However, the problem with the rich man was that there was still a part of his life that was at odds with the kingdom of God. So Jesus told this man to go take care of this one thing by giving it up and then come follow him (v. 22). Why? Because Jesus was not trying to help this man apply God’s word to the life he was already living but instead was calling this man to let go of his life and accept the new kingdom life Jesus imagine for him. With all that said, I believe that I am called not to help the church apply the scripture to the lives we are already living, but to preach in such a way that we may let go of our own lives and embrace the life God imagines for us in scripture. In this way, I believe preaching serves the aim of the gospel or in other words, serves our formation as disciples of Jesus Christ. And as one who is nothing more than a disciple still stumbling along as I follow Jesus, I pray that I will preach God’s word boldly but with humility that is full of grace and truth. * This post is a slightly revised version originally published as an article titled “A Word on Preaching” in Connecting 28 (June 26, 2013), a biweekly publication of the Columbia Church of Christ. This entry was posted in Columbia Church of Christ, Preaching and Teaching, Scripture. Bookmark the permalink. This is a very important topic, which I wish we discussed more often than we do. I appreciate your thoughtfulness in addressing it. Thank you for your reply. I think in the times past that it was always assumed that people, Christians especially, understood the why of preaching. I don’t think we can afford to take that assumption for granted any more. So yes, we should be discussing this topic more. Expository preaching was supposed to be preaching’s great awakening, getting preachers off of outline books. But for many it simply became a weekly running commentary. Many still waited until Saturday night to prepare. Even with the Bible as one’s outline book, it still takes a hungry heart and mind to prepare and a willingness to expose one’s soul to deliver. Evangelicalism does not have enough of these. You are so right about it taking a hungry heart and mind to prepare the sermon message. I still hear some people say that they don’t prepare because they just let the Holy Spirit speak through them but that to me just seems to be justifying laziness by claiming the leadership of the Spirit. If the Holy Spirit leads us in our preaching (which it does) then it can also lead us in our preparation. Thanks for your comment! Yes, I concur with what brother Rex has commented herein. I am asking if whether brothers can get us materials and bulletins to translate into Arabic?